Bright and colourful Pohutukawa Trees line the shores of a small cove at Maitai Bay along the Karikari Peninsula on the East Coast of the North Island in New Zealand. These trees are also called the New Zealand Christmas Tree. These bright Pohutukawa Trees seen here along the shores of this small cove at Maitai Bay on the Karikari Peninsula, which is situated on the East of the North Island of New Zealand in Northland, are one of the most loved and fantastic trees in the whole country. The Pohutukawa tree is also affectionately known as the New Zealand Christmas Tree because it is literally covered in beautiful bright red blooms during December. 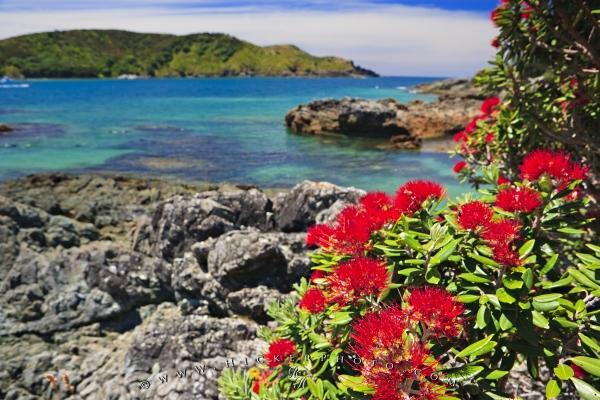 Photo of Bright Pohutukawa Trees at Maitai Bay on the Karikari Peninsula, East Coast, North Island, New Zealand. Pictures from photo gallery "New Zealand Pictures"
This picture is part of the photo album "New Zealand Pictures" - there are more beautiful images waiting for you. There will not be very many other species of plant in this area as often the Pohutukawa Trees will be the only species that will survive in this area. Depending on the conditions of the growing area, the tree can be over 20 metres in height or it can barely be one metre in height. The Karikari Peninsula is basically an area of just rocks, and used to be an island but is now joined to the Aupouri Peninsula by a sand bank. This area of New Zealand has beautiful weather; hot enough to grow grapes, but habitation is scarce except for those camping at the nearby campground. Bright Pohutukawa Trees, Metrosideros excelsa, lining the shores of a small cove at Maitai Bay on the Karikari Peninsula, East Coast, Northland, North Island, New Zealand. I photographed this photo with the digital SLR camera model Canon EOS-1Ds Mark II, aperture of f/9.0, exposure time of 1/60 sec. on ISO 100, as always I used a original Canon Lens, the focus lenght for this picture was 24mm.